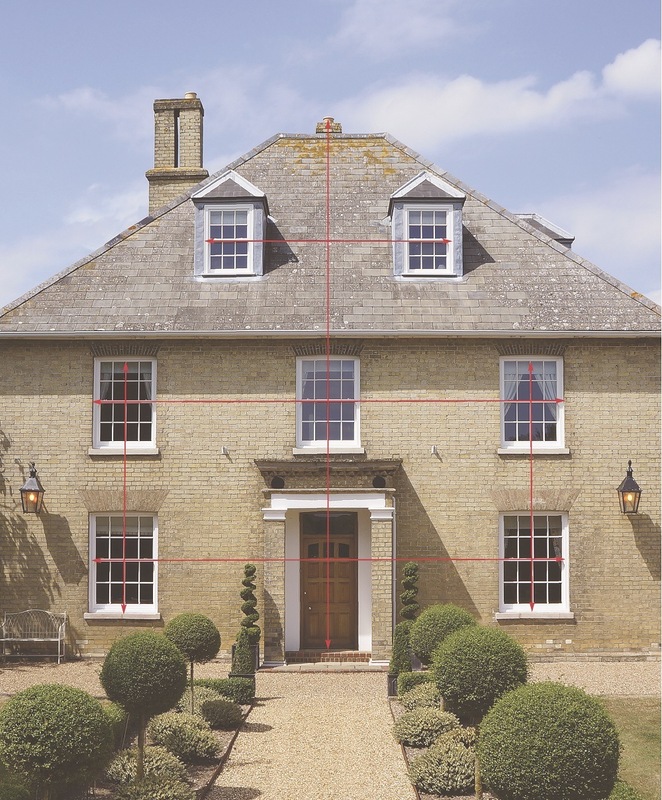 Well-thought out sightlines can make all the difference to the visual impact of your property. Wherever possible, the horizontal lines formed by window bars should match up across the windows and doors of the property. The annotated illustration above shows this design ‘trick’ more clearly. This works particularly well for double-fronted houses with central front doors, but can also smarten semi-detached and terraced homes considerably, bringing balance and elegance. We can also ensure that any non-opening (or dummy) sashes are in-line with those that do open. Whilst grand buildings (especially from the Georgian and Victorian periods) conjure this design feature effortlessly, the good news is that your local Timber Windows showroom will include this as part of your project, advising on how best to bring balance to the look of your home’s new windows and doors. There is one over-riding idea to keep front of mind when replacing windows in a character property – they must be “sensitive” to the age, construction and appearance of the original building. 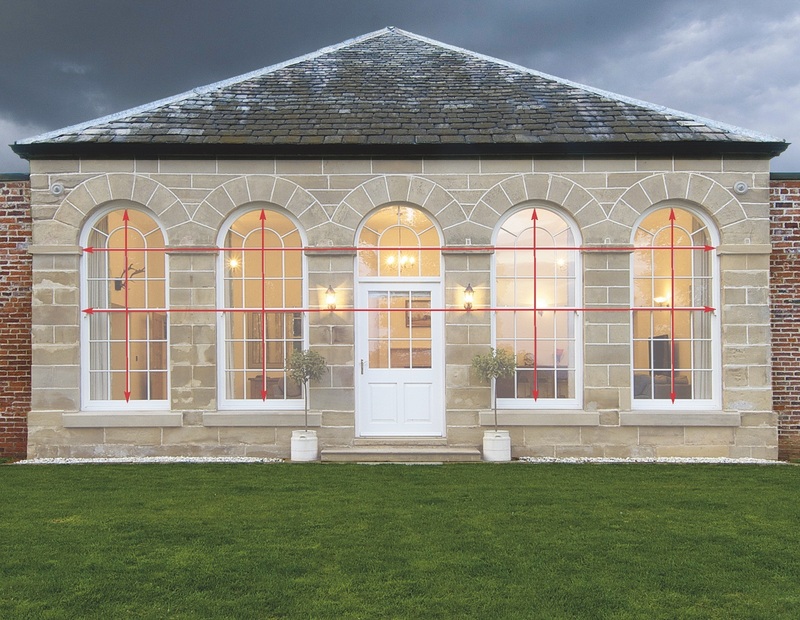 The proportions of timber, meeting rails and glazing bars, along with correctly specified glazing are all important considerations in referencing existing and original windows to replicate the details wherever possible. Homes that have been designed with all kinds of contemporary and traditional architectural influences can benefit from professional guidance with regards sightlines in bringing harmony and symmetry to its appearance, to achieve the desired effect, whether to replicate or refresh. All too often we arrive to find previous replacement windows that are anything but “sensitive”, especially with regard to the frame depths and through bars. Overly heavy and far too wide, these can all too easily spoil the appearance not just of the windows, but on the home itself. 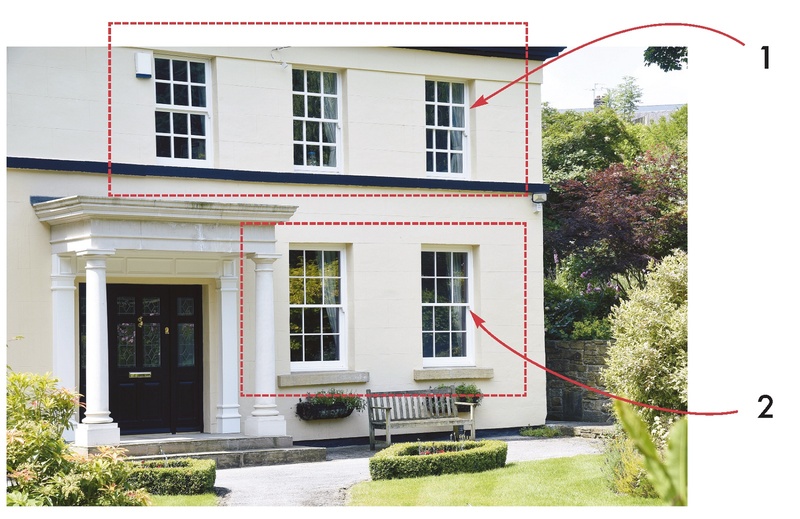 The annotated image below shows just what can happen, however, with expert guidance, especially from your Timber Windows showroom, these issues can be avoided. 1 – Existing replacement windows, Note: the thicker through bars, and incorrectly sized meeting rails and bottom rails. 2 – New replacement Sash windows by Timber Windows, Note: the thinner through bars, true to the originals.